A6 landscape complete with white envelope and cello wrapped. Giclee print on recycled card with thumbnail image on reverse. Price per card to UK ~ £2.50 including p+p. 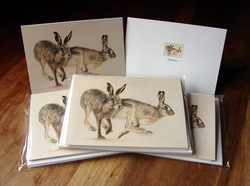 Price per pack of 5 cards to UK ~ £10.00 including p+p. Price per card to Europe ~ £2.50 plus £2.50 p+p up to 4 cards. Price per card to World ~ £2.50 plus £3.50 p+p up to 4 cards. To make a purchase ~ Please contact me via the contact form so that we can exchange address and payment details. Payment can be made by cheque, cash or electronic bank transfer. Also available, On the run mugs! 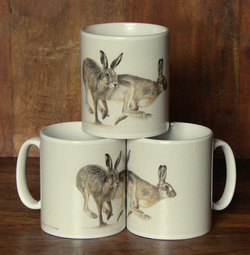 These high quality ceramic mugs are printed in small batches in the UK. Holds approximately 340mls (just over half a pint). Wraparound design with small line of text near the handle to identify the artwork. 1 x mug ~ £14.00 including UK p+p. 2 x mugs ~ £27.00 including UK p+p. 3 x mugs ~ £39.00 including UK p+p. 4 x mugs ~ £50.00 including UK p+p. 5 x mugs ~ £60.00 including UK p+p. UK orders ~ please allow 14 days for delivery. Overseas orders ~ please contact me for a postage and delivery quote. Price per card to Europe ~ £2.50, plus £2.50 p+p up to 4 cards. Price per card to World ~ £2.50, plus £3.50 p+p up to 4 cards. A6 portrait complete with white envelope and cello wrapped. Only 12 left in stcok. 1 x Grey wolf, 1 x Majesty) complete with envelopes and individually cello wrapped. Price per pack to UK ~ £9.00 including p+p. Price per pack to Europe ~ £9.00 plus £2.50 p+p. 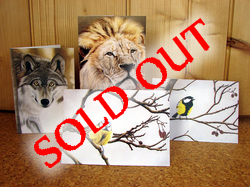 Price per pack to World ~ £9.00 plus £3.50 p+p.